It has been awhile since I last posted. In fact our most recent post from September was a guest post by my mom (aka mother-in-law) Monica. It is not due to the fact that there haven't been anything worthy to blog about. On the contrary we have been very busy spreading the Good News to many different town. I have just had a hard time sitting down to write the stories of the people I have come to know, the times I have come to cherish but most importantly because I have come to love them. I have in fact written a few blog posts which I have deleted because I did not deem it appropriate for me to share intimate details about my friends lives especially their hurts, their falls and their sufferings. 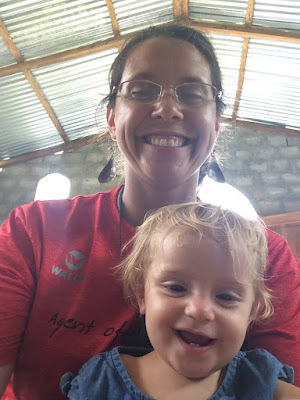 Intitially when I started blogging over four years ago I only shared our stories and then at some point I started sharing intimate details about the people who we came to serve. Initially it was out of pride and excitement of our missionary life and what God was doing. Then it seemed like it turned into a necessity. I realise now that those are the wrong reasons. I also see how I might have hurt my dear friends by sharing such intimate details of their lives. I am deeply sorry for my offenses. I have decided once again to return to detailing our family's missionary journey. The good, the bad and the sometimes ugly. If any of my friends do feel the desire to share the story with you I will ask them to be a guest writer just as Monica was. I was trying to keep Maria quiet during one of our classes when Taylor was talking.